Whether milling raw timber or using recycled lumber, this powerful and accurate hand held detector will help you save valuable saw, planer, and jointer blades by locating embedded metal before you cut. 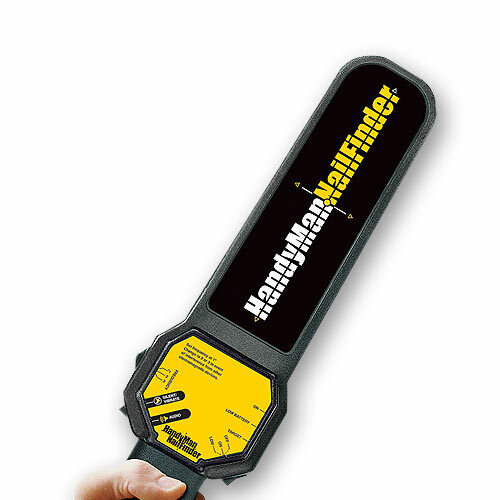 The Bounty Hunter Handyman NailFinder detects nails, screws, wire, bullets, staples, tacks, and other small metal objects up to 6" deep, even in dense woods. Detector has a 5" long x 2-1/2" wide detection path to speed the lumber scanning process. 2) A Vibration Alert for noisy workshop situations. Both Alerts operate with equal accuracy. Detector also has 3 frequency settings to avoid interference from other electronic devices, plus a Momentary Low setting that reduces the detection range to eliminate potential false readings from known nearby metal objects.